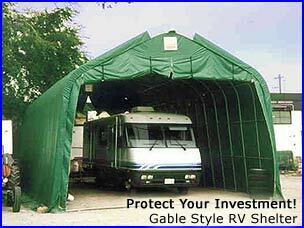 Protect your investment from harmful UV, Rain, Snow, and Hail with Dome Shelter SystemsTM RV garage! If you are looking to buy or build an awning or storage building to protect your RV consider an economical, portable Dome Shelter SystemTM. Our enclosed canvas RV garages are less expensive than traditional models, yet more protective than travel trailer awnings or simple motor home covers. Remember, Dome Shelter SystemsTM has been in business for over 10 years creating top quality RV sheds. When you purchase a Dome ShelterTM, you have the peace of mind in knowing you made the best choice. Double wide units are popular for combined Boat and RV storage units. You will need at least a 10 ft. sidewall, on a 20, 22, or 24 ft. wide unit. We also carry garages, carports, plus hundreds of other models for all residential, commercial, and industrial applications.